A constant temperature is vital to the medical and pharmaceutical industry. Combining reduced thickness and reduced energy use, TURVAC® Vacuum Insulation Panels promise optimal temperature conditions, secure storage and carefree transport of temperature-sensitive materials. To ensure cargo safety, today’s companies are increasingly relying on specialized cold chain logistics and technology. With characteristics of a super-insulation material, vacuum insulation panels allow longer storage time and safer transportation conditions. 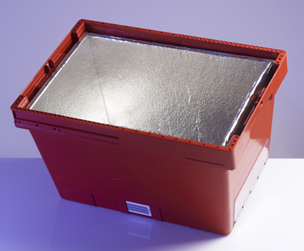 Because of its low thermal conductivity, use of VIPs in TURVAC© temperature controlled boxes (and containers) will ensure the ultimate level of thermal protection for any precisely controlled refrigerated storage of high value commodities. It will also allow the maximum possible available internal volume within any size of box. TURVAC© Insulation solutions offer an extremely effective performance to ensure that medicine and other temperature-sensitive components maintain their integrity throughout the cold chain distribution process. Equipped with vacuum insulation panels, containers for the distribution of vaccines, donor organs as well as pharmaceutical products which require storage at specific temperatures for extended periods of time can meet the severe demands of new directives of pharmaceutical / medical industry. Together with pharmacy wholesale merchant, we developed TURVAC mobile medicine box adapted to their needs. Isolated with vacuum insulation panels, it keeps the inside temperature between 2 and 8 ˚C up to 30 hours only by using cooling components (PCM). Moreover, due to thinner isolation the volume of mobile box can be greatly improved. Increased volume due to thinner isolation. 2 and 8 ˚C for a longer period. More design and shape flexibility. Vacuum Insulation Panels are the best solution for every industry! TURVAC® Products are applied in a wide variety of insulation applications that require excellent thermal performance, optimum energy efficiency, or minimum insulation thickness. refrigerators for mobile homes, campers and other vehicles.